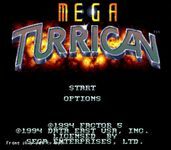 Mega Turrican is a 16-bit shooter game, developed by Factor 5 in 1993 and marketed by Data East in 1994. This game of the Turrican series was initially designed for the Mega Drive/Genesis, and later followed by an Amiga port under the title of Turrican 3: Payment Day. However, despite not being the original, the Amiga version was the one that was first commercially released in 1993, published by Rainbow Arts in Germany and Renegade in the rest of Europe. The Mega Drive version didn't have a publisher and stayed unreleased from spring 1993 until 1994, when Data East took over its worldwide distribution. Data East itself released the game in North America, and contracted Sony Imagesoft for the game's distribution in Europe. The Mega Drive version of the game was re-released on the Wii's Virtual Console service in Europe and Australia on March 22, 2008 and on April 14, 2008 in North America. Source: Wikipedia, "Mega Turrican", available under the CC-BY-SA License.